Below you will find informaiton on how to get the Big Pink Volleyball Tournament started at your institution. If you have any questions, feel free to contact one of our school contacts as they are more than willing to help you as you establish the tournament. The cost to run a Big Pink Volleyball Tournament is dependant upon how much you want to put into it. At the bare minimum, the tournament will cost $205 in its start up year as that is the cost for a Big Pink Volleyball. As you add publicity, promotional items, shirts, and other things, you cost may go up but as is the case for any event, you can work within your own budget to find something that works for you. -Student Chair - oversees other chairs and executes overall vision of the tournament. -Educational Opportunities Chair - collects and shares educational information about breast cancer. Can also serve as the main point of contact for Susan G. Komen or other philanthropies. -Public Relations Chair - oversees marketing and branding of the event. -Registration Chair - oversees all entries, shirt orders, and bracketing for the tournament. - Referring Chair - oversees the traning and scheduling of referees for the tournament. -Recruitment Chairs - if you want to target registration from such entities as Greek Life, Housing, or Student Organizations, you can implement recruitment Chairs to serve as a main liason for those individuals and can establish goals of number of teams for them to recruit. To purchase the balls for Big Pink, you can visit Gopher Sport on the web at www.gophersport.com and search "Kinball." Additionally, you may need an air pump to fill the ball. Before purchasing one, though, you may want to check with your university's campus recreation department because they may have one that they are able to lend. The balls are fairly sturdy but it is always nice to have a replacement bladder on hand just in case something happens. To prevent damage to the ball, consider establishing a "no jewelry" rule for your tournament. Once you establish a location for your tournament, one of the things that you will need to figure out will be how you want your court to be set up. 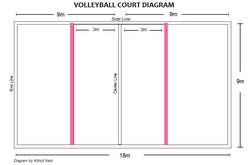 Big Pink Volleyball requires no additional lines or materials from a typical volleyball game. The net height is up to you, but we would recommend using the men's height because it takes away the opportunity for taller people to "spike" the ball down during a volley. Part of the beauty of Big Pink Volleyball is that many of the rules are similar to that of a regular volleyball game. Most participants have previously played at least one game of regular volleyball at some point in their life so they often times don't require any additional education about the general rules. However, you can implement some Big Pink specific rules if you decide to do so. Some of these rules may include team gender breakdown, whether both men and women can jump, where serving should take place, and time length. Check out the rules below to get a better feeling of what rules currently exist at institutions throughout the country. To serve this four foot volleyball, you don't hit it from the back line as you would in a typical volleyball game. Instead, you serve from the ten foot line, or "Attack Line," which is marked in pink in the image above. Two people hold the ball between them while their feet are spread across the Attack Line, while a third person runs up and hits the ball over the net. Servers can either hit the ball with closed fists or open hands with their palms open to get the ball over the net. For a video ofo the serving method, please go to the "Media" tab and click on Western Illinois Univeristy's 2009 video. A variety of serves are featured in this video. Typically, Big Pink Volleyball Tournaments are set up as a single elimination tournament. Your number of registered teams will determine how you set up your bracket though. One thing to keep in mind is if you want to have a mixed bracket with all of the different types of organizations playing each other or if you want to have organization specific brackets (IE: Greek bracket, residence floor bracket, Faculty/Staff bracket, etc.). You may also want to consider what if you want to have a prize for the tournament winner. Some institutions choose to give the winners free t-shirts with the word "CHAMPION" on them while others create a traveling trophy that can be used year after year at the tournament. What you do is completely up to you and will be determined by your budget. As you can imagine, Big Pink Volleyball is a fairly easy game to referee. Typically, one ref can be used to see the entire court but it is easier on them if you have two- one located on each side of the center line. They don't require a whistle, but it is up to you if you want to provide one for them as they facilitate the game. Before you begin your tournament, be sure to meet with them to go over all rules as they will be the ones enforcing them on the court. Additionally, to make it easier on participants and referees, it may be beneficial for you to have a pre-game meeting for each team that hasn't played in the tournament yet. At this time, you can make sure jewelry is off and can go over rules and serving techniques to same time and headaches for your referees during the games. To ensure that your participating teams know their game times and the basic rules, you may want to conduct a Captain's Meeting prior to the start of the tournament. At this meeting, you will go over basic information for the tournament. A sample powerpoint has been included below. To collect information regarding your teams, a registration packet should be created and required for all entries. In this packet, you can include basic information including rules and tournament times, but can also include a t-shirt order form should you decide to sell t-shirts. A sample packet, which included the registration form and rules, is included below. Each university that hosts the Big Pink Volleyball Tournament has different components that make it unique to that institution. Below are some of the ideas that have been shared that you can adapt on your campus. As a way for your students to express themselves, you may want to consider having a theme contest. If you have a theme with your event, students are excited to dress up and get creative as part of the tournament. Your theme can be something as simple as "Think Pink" and participants will come with as many pink things as they can muster. It really helps to create a fun atmosphere and allows participants to realize that this is a fun event to rally around. 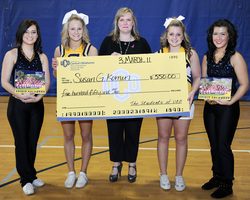 To the right is a picture from UCO's first costume contest. The theme was "Think Pink" and members of the Pre-Dental Society called themselves the "Pink Dental Society" and came with teeth on their shirts and pink toothbrushes around their necks. For their efforts, each member of the team received a small bag of pink M&Ms. For those individuals that may know someone that has been affected by breast cancer, this Wall of Wishes is an opportunity for them to pay tribute to them and acknowledge that they are playing for a particular person. It is also an inexpensive yet meaningful way for participants to engage in the tournament while they are not playing in a game.This is also a great way to show your tournament as it progresses. If you save the Walls of Wishes, you can keep them on display at tournaments in the years to come. As a way to publicize your event, you can host a "Kick Off Event" where participants can turn in their registration packets and you can pass out more information about the event for those that may not have heard about it yet. This is a great way to get information out and leave a visual imprint on campus- particularly if you host it in a high traffic area during the middle of the day. The biggest thing to remember is to bring the ball with you when ever you publicize for the event. People may not remember words that you say in passing about another event on campus, but they won't forget a four foot pink ball as it goes through your campus. One important element of the tournament is the big reveal of how much money you have raised. It is up to you how you want to make the announcement, but it is a very special moment for participants and committee members if you are able to host a check presentation during the tournament. It doesn't need to be big, but it can be a really cool moment if you have the time to allow your students to talk about their experiences with Big Pink. As another way to raise funds for your cause, you may consider having a raffle for your tournament. You can solicit donations from local area businesses for the raffle and may even be able to receive other donations such as a mammogram or other services. It is a great means to raise money as you go through the event!